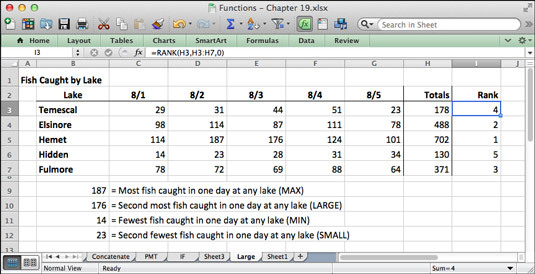 Excel offers more than four hundred different functions to give you increased functionality for crunching the numbers on your iPad or Mac. 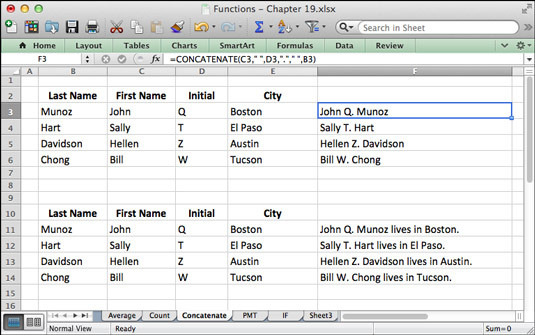 Here are ten of the more interesting and useful functions you can use with Excel. Might as well start with an easy one. The AVERAGE function averages the values in a cell range. Here, AVERAGE is used to compute the average rainfall in a three‐month period in three different counties. Excel ignores empty cells and logical values in the cell range; cells with 0 are computed. 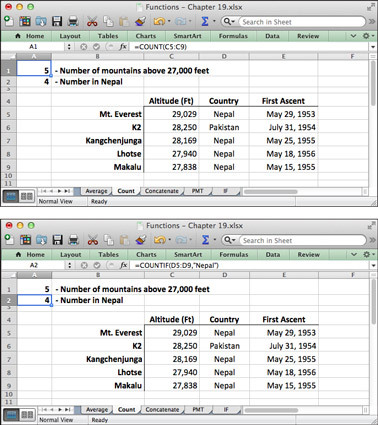 The COUNT (above) and COUNTIF (below) function at work. Similar to COUNT is the COUNTIF function. It counts how many cells in a cell range have a specific value. To use COUNTIF, enter the cell range and a criterion in the argument, as follows. If the criterion is a text value, enclose it in quotation marks. To include blank spaces in the text you’re combining, enclose a blank space between quotation marks as an argument. Moreover, you can include original text in the concatenation formula as long as you enclose it in quotation marks and enter it as a separate argument. Use the CONCATENATE function to combine values from cells. Use the PMT (payment) function to explore how much you can borrow given different interest rates and different amounts. PMT determines how much you have to pay annually on different loans. After you determine how much you have to pay annually, you can divide this amount by 12 to see how much you have to pay monthly. Exploring loan scenarios with the PMT function. The IF function examines data and returns a value based on criteria you enter. Use the IF function to locate data that meets a certain threshold. In the worksheet shown, for example, the IF function is used to identify teams that are eligible for the playoffs. To be eligible, a team must have won more than six games. Instructing Excel to enter a value if the logical true‐false test comes up false is optional; you must supply a value to enter if the test is true. Enclose the value in quotation marks if it is a text value such as the word Yes or No. If the false “No” value was absent from the formula, teams that didn’t make the playoffs would not show a value in the Playoffs column; these teams’ Playoffs column would be empty. Use the LARGE and SMALL functions, as well as their cousins MIN, MAX, and RANK, to find out where a value stands in a list of values. For example, use LARGE to locate the ninth oldest man in a list, or MAX to find the oldest man. Use MIN to find the smallest city by population in a list, or SMALL to find the fourth smallest. The RANK function finds the rank of a value in a list of values. Using functions to compare values. Excel offers a couple of date functions for scheduling, project planning, and measuring time periods in days. TODAY gives you today’s date, whatever it happens to be. Use this function to compute today’s date in a formula. To measure the number of days between two dates, use the minus operator and subtract the latest date from the earlier one. The dates are enclosed in quotation marks to make Excel recognize them as dates. Make sure that the cell where the formula is located is formatted to show numbers, not dates.